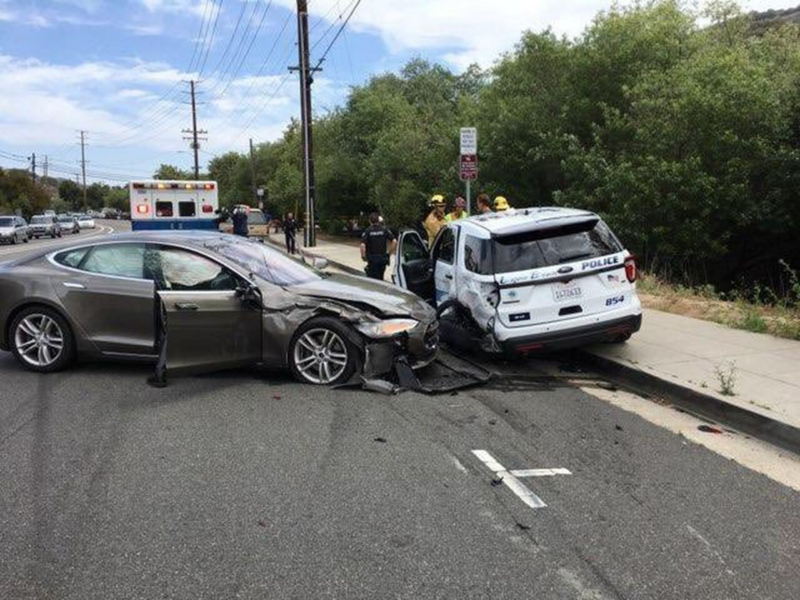 A Tesla sedan in Autopilot mode crashed into a parked Laguna Beach Police Department vehicle Tuesday morning, authorities said. The collision happened at 11:07 a.m. at 20652 Laguna Canyon Road, according to Laguna Police Sgt. Jim Cota. The officer was not in the cruiser at the time of the crash. The Tesla driver suffered minor injuries, but refused transportation to the hospital. "Thankfully there was not an officer at the time in the police car," Cota said. "The police car is totaled." Cota said that a year ago in the same area there was another collision involving a Tesla running into a semi-truck. "Why do these vehicles keep doing that?" Cota said. "We're just lucky that people aren't getting injured." Tesla's Autopilot driver-assist feature has come under scrutiny following other collisions. A Tesla driver in Utah crashed while using Autopilot and looking at her phone earlier this month. Two fatal crashes while the system was being used also have occurred: one in California in March and a 2016 crash in Florida. The Palo Alto-based automaker, led by Elon Musk, has said it repeatedly warns drivers to stay alert, keep their hands on the wheel and maintain control of their vehicle at all times while using the Autopilot system. "Tesla has always been clear that Autopilot doesn't make the car impervious to all accidents, and before a driver can use Autopilot, they must accept a dialogue box which states that 'Autopilot is designed for use on highways that have a center divider and clear lane markings,'" a Tesla spokesperson said in an emailed statement.